Mafia 3 could be set in Louisiana, according to a recent casting call for an unannounced Take-Two game. 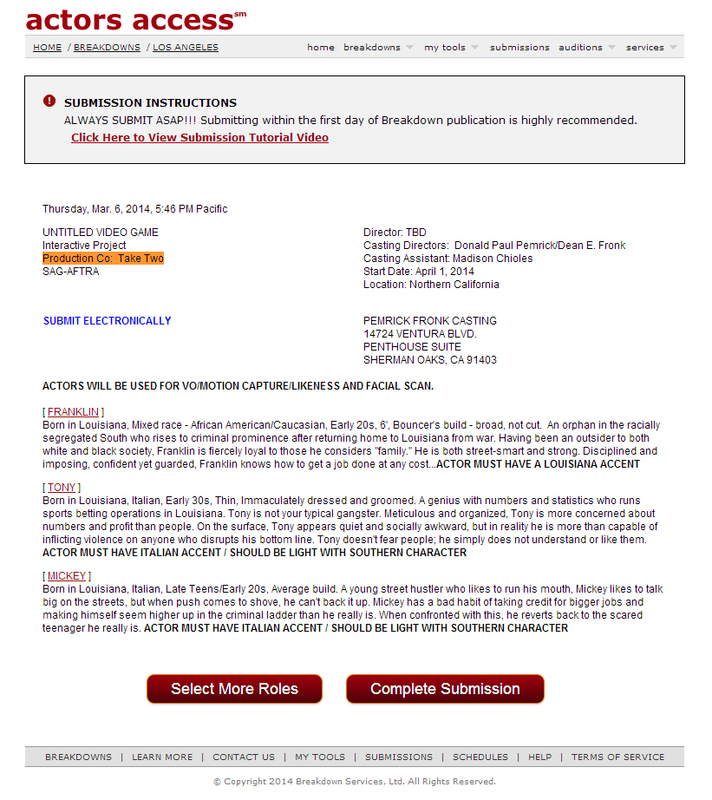 The call was posted on Actors Access, and as you can see from this document, the production company is listed as publisher Take-Two. It adds that successful candidates will have their likenesses scanned for voice-over and motion capture purposes. Born in Louisiana, Italian, Early 30s, Thin, Immaculately dressed and groomed. A genius with numbers and statistics who runs sports betting operations in Louisiana. Tony is not your typical gangster. Meticulous and organized, Tony is more concerned about numbers and profit than people. On the surface, Tony appears quiet and socially awkward, but in reality he is more than capable of inflicting violence on anyone who disrupts his bottom line. Tony doesn’t fear people; he simply does not understand or like them. Born in Louisiana, Italian, Late Teens/Early 20s, Average build. A young street hustler who likes to run his mouth, Mickey likes to talk big on the streets, but when push comes to shove, he can’t back it up. Mickey has a bad habit of taking credit for bigger jobs and making himself seem higher up in the criminal ladder than he really is. When confronted with this, he reverts back to the scared teenager he really is. There’s no mention of Mafia 3 explicitly, and if the Louisiana setting is accurate, we could be seeing the next game set in an open world New Orleans. Last we heard; 2K Czech was hiring for a secret AAA project, but that was before 2K Prague shut its doors. The status of the game and which team is making it remains unclear.